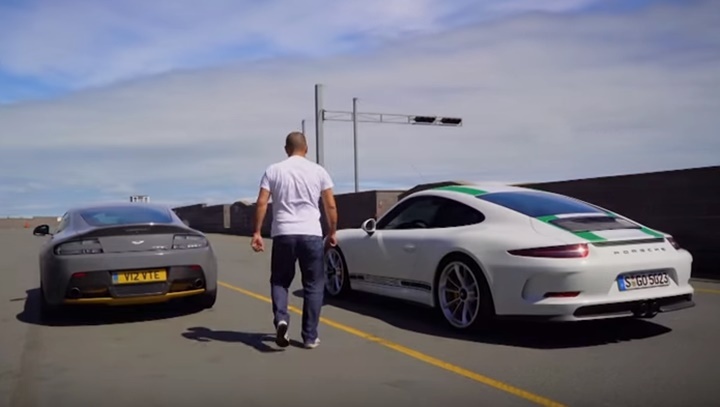 There was no coincidence that Chris Harris has put side-by-side two of the most outstanding sports cars in the world at the moment, no other than the 2016 Porsche 911 R and the 2017 Aston Martin V12 Vantage S.
The video below showcases the extraordinary capabilities that both models are coming with, representing the peak of technology available at the moment on the market. We have seen the 2016 911 R in a recent test drive and we know what it can do on track or road, while the 2017 V12 Vantage S is the symbol of advanced driving dynamics and sheer performance. And these two are perfect to go against each other in an 18-minute video, with the famous journalist behind the wheel of both cars and comparing their handlings, steering and performance. As a reminder, the 2016 Porsche 911 R comes with a lot of high-tech tweaks, which make it extremely performance, such as Porsche Ceramic Composite Brake (PCCB), Porsche Stability Management (PSM), titanium sport exhaust system, 20-inch lightweight wheels and so on. In the engine department, the model brags with a 3.8-liter naturally-aspirated flat-six engine, with 500 horsepower and 460 Nm of torque, enough to deliver a sprint from 0 to 100 km/h in 3.8 seconds. The topping is set at 323 km/h. On the other hand, the 2017 Aston Martin V12 Vantage S features a high-performance seven-speed manual gearbox or an optional automatic manual gearbox with “Sportshift III” paddle-shift, which makes it extremely powerful and high-performance. On that matter, the sports car uses a massive 6.0-liter V2 engine, with 565 horsepower and 457 lb-ft of torque. The sprint to 100 km/h is done in 3.9 seconds, at a topping of 336 km/h. So we have two sports cars with rather close performance figures and powertrains, but different driving characteristics. You get to judge which one is better than the other by watching the video below!